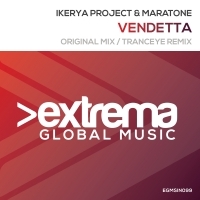 Next up for Extrema is Ikerya Project and Maratone with Vendetta. The Original is all about pumping bass and big breakdown chords that push through the breakdown with more than a hint of acid for good measure. TrancEye carrys on the theme with his excellent remix that cuts through in all the right places. 'Vendetta' is available now from Beatport and iTunes.